Pentagon assessing transfer of Guantanamo detainees to US facilities. 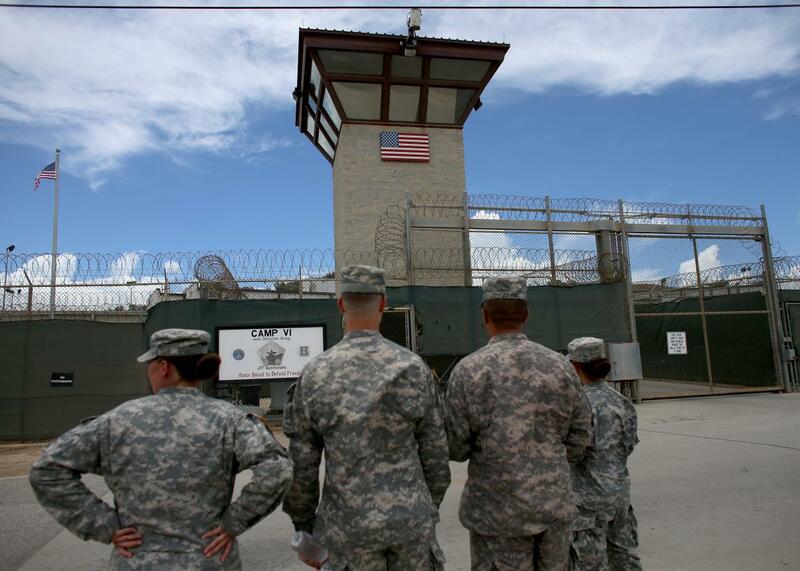 Military officers stand at the entrance to Camp VI and V at the U.S. military prison for enemy combatants on June 25, 2013 in Guantanamo Bay, Cuba. The Department of Defense is back at it again, trying to figure out how it can go about transferring Guantanamo Bay detainees to U.S. military facilities. The Pentagon has told Congress that a team of experts is assessing possible sites for a transfer. First up was Fort Leavenworth, Kansas, and is planning to tour the naval brig in Charleston, South Carolina next week. The possibility of transferring the detainees to civilian facilities is also being analyzed, reports NBC News. The move is far from imminent. “The Pentagon made clear no decisions had been made and the site visits are aimed at getting a ‘baseline standard’ on costs and requirements of a detention facility to house Gitmo detainees,” reports CNN. And nothing could be done without the approval of Congress as lawmakers would have to change a 2010 law banning the transfer of Guantanamo detainees to the United States. There are currently 116 detainees in Guantanamo. The administration wants to transfer as many as 52 detainees to other countries.